Custom AMD APU silicon previously touted as the early spec for the PlayStation 5 has resurfaced online. The AMD APU first appeared back in January – its specs list decoded from a jumbled alphanumeric string – and it appeared to be in the very early stages of development. But the most recent leak shows the red team has made progress on the Zen/Navi chip. The first string we got our hands on was 2G16002CE8JA2_32/10/10_13E9. This showed a CPU with eight physical cores, a 3.2GHz boost clock, and a PCI-ID reportedly that of an AMD Navi 10Lite GPU. We couldn’t confirm whether the architecture used within the CPU was Zen+ or Zen 2, but it was suspected to be the former due to the numeral representing the cache size. Either way the silicon looked to be a lot more powerful than the Jaguar cores the PS4 Pro is currently rocking. The latest code is ZG16702AE8JB2_32/10/18_13F8, which we can decode somewhat with MoePC’s decoder. The “Z” at the beginning would imply this chip is inching closer to a finalised product. 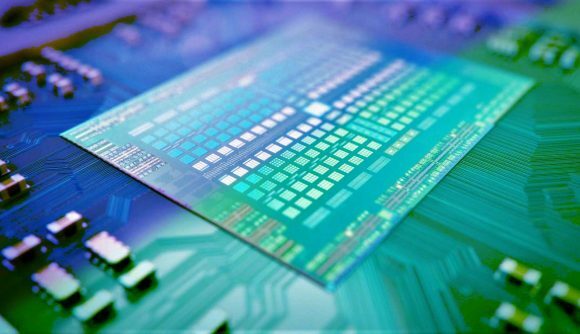 And it looks like many of the specs have remained unchanged, such as eight physical cores and a boost clockspeed of 3.2GHz. There have been some further changes to the ID, however, such as stepping seemingly increasing from “A2” to “B2”, which could confirm further progress has been made on the chip. The code was spotted by TUM_APISAK, who was also responsible for digging up the previous AMD codename. There are still many unknowns, however, and TDP, base clock, and GPU clocks remain murky. The codes do not explicitly follow an exact pattern every time, as this often varies by revision and how far along the development cycle each chip is. The previous PCIe ID, “13E9”, has also been revised to “13F8”, expected to be an iteration on the previous Navi 10Lite GPU. The “10” previous to the PCIe ID was expected to be the clockspeed for the GPU, rating it at a reasonably fast 1GHz. However, the latest code at “18”, or 1.8GHz, would be immensely fast APU graphics silicon. The GPU within the PS4 Pro runs at just 911MHz today. So there goes that theory for the time being. It has also been speculated that this chip could be that of Microsoft’s next-gen Xbox. After all, both Sony and Microsoft consoles currently utilise red team silicon and both have reportedly expressed interest in working with AMD going forward. AMD’s burgeoning semi-custom unit is racking up some serious business nowadays, including Google Stadia and bespoke chips for major games consoles worldwide. Much of the tech within either Sony or Microsoft’s next-gen consoles remains a mystery – even given the occasional exciting codename to decipher. Even AMD’s own roadmap is only a little clearer. AMD Ryzen 3000 processors are expected to launch mid-year, potentially following an announcement at Computex by CEO Dr. Lisa Su, and AMD Navi graphics cards are reportedly still on track for sometime in 2019.